I’ve been leaning more and more towards eggs as a quick meal, especially with the girls laying regularly nowadays. This is one of my simple go-to’s–meaty roasted asparagus spears topped with a luscious poached egg and crispy prosciutto. If you want to go meatless, saute some mushrooms and shallots in lieu of the prosciutto … mmmm. This simple recipe is just right when you're craving fresh spring flavors. Roasted asparagus has a wonderful, deep flavor that's lovely against the luscious poached egg. To trim the asparagus, just hold a stalk and break it like you would a pencil -- the tough, woody end snaps off naturally. Preheat oven to 450 degrees F. Fill a wide pot 3 inches deep with water. Add vinegar and a good pinch of salt, and bring to a boil. Lower heat to maintain a gentle simmer. Toss asparagus to coat with olive oil and again with a pinch of salt and a grind of pepper. Spread out into a single layer on a baking sheet and roast for 5-8 minutes, until just tender to the bite. Divide asparagus among 4 plates. While asparagus is roasting, crisp prosciutto for 3-4 minutes per side in a nonstick pan over medium heat. Transfer to a cutting board and coarsely chop. While prosciutto is crisping, give the water a good stir to create a gentle swirl. Working quickly, break one egg into a ramekin, gently tip it over the sink to let any super-thin liquid drain off, then dip the edge of the ramekin into the water near the center of the pan and slide the egg out. Wait a beat while the egg slips to the edge, then add the next egg. Repeat with remaining 2 eggs (give the water another gentle swirl if need be in between eggs, once the white has set). Poach eggs for 3-5 minutes, depending on how firm you want your yolk, and then remove each with a slotted spoon and place on top of a mound of asparagus. 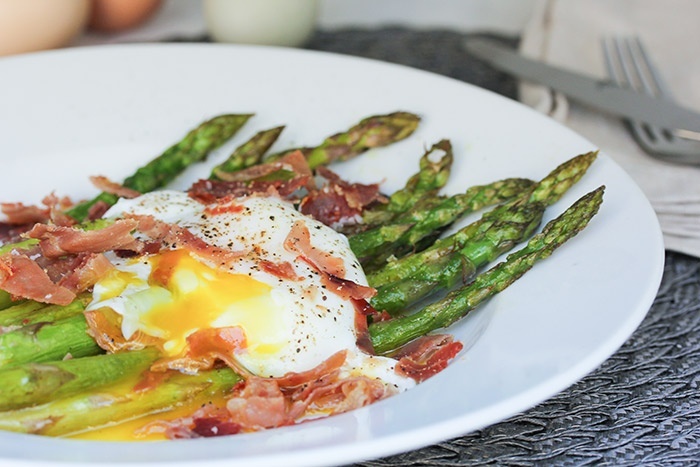 Top egg and asparagus with a generous grind of black pepper and crumbled prosciutto.